Jian Li’s current research employs the system design and signal processing algorithm to improve the data rate for high-speed wireless local area networks using multiple transmit and receive antennas. Li’s work also contributes to humanitarian and military causes. She is currently developing ways to improve plastic landmine detection using ground penetrating radar for surveillance and quadruple resonance technology (QR) for confirmation. QR is similar to the technology used in airports for explosive detection. “The problem with using QR for landmine detection in a mine field is the strong radio frequency interference. There is no way to avoid it, and unlike at the airports, there is no way to block it either,” Li says. Li’s goal is to find methods to suppress radio frequency interference and more efficiently detect explosives. Another practical aspect of Li’s work is her research in acoustic imaging. This process is used to examine the physical mechanisms of noise generation in planes and space shuttles to design quieter aircraft and spacecraft. She tries to localize the noise source by creating acoustic images using microphone arrays. 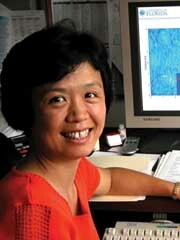 Li, who directs the Spectral Analysis Laboratory at UF, has secured grants and contracts totaling about $4.5 million since joining the UF faculty in 1993. Her publications, including more than 110 refereed journal papers and almost 100 conference papers, have been cited more than 60 times per year on average for the past five years.